Turipo - 3 Day trips from Tokyo. 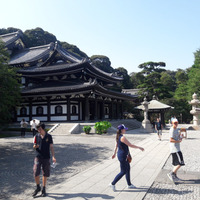 3 day trips full travel plan from Tokyo during our summer vacation in Japan: from Tokyo to Nikko, Kamakura and Hakone, the best things to do in Hakone, Kamakura and Nikko, the best things to do in Tokyo and around, Tokyo travel planner. Description: 3 day trips full travel plan from Tokyo during our summer vacation in Japan: from Tokyo to Nikko, Kamakura and Hakone, the best things to do in Hakone, Kamakura and Nikko, the best things to do in Tokyo and around, Tokyo travel planner. Shiraito Fallsis a waterfall in Fujinomiya, Shizuoka Prefecture, near Mount Fuji, Japan. It is part of Fuji-Hakone-Izu National Park and has been protected since 1936 as a Japanese Natural Monument. The falls were regarded as sacred under the Fuji cult. Another waterfall, the Otodome Falls is more.. approximately a five-minute walk away. The Shiraito Falls is listed as one of "Japan’s Top 100 Waterfalls", in a listing published by the Japanese Ministry of the Environment in 1990. It was also selected by the Tokyo Nichi Nichi Shimbun and Osaka Mainichi Shimbun. as one of the 100 Landscapes of Japan in 1927. In 2013 the waterfall was added to the World Heritage List as part of the Fujisan Cultural Site. less..
Tokyo Station is a railway station in the Chiyoda City, Tokyo, Japan. The original station is located in Chiyoda's Marunouchi business district near the Imperial Palace grounds. The newer Eastern extension is not far from the Ginza commercial district. Due to its large area covered, the station is more.. divided into Marunouchi and Yaesu sides in its directional signage. Served by Shinkansen high-speed rail lines, Tokyo Station is the main intercity rail terminal in Tokyo. It is the busiest station in Japan in terms of number of trains per day, and the fifth-busiest in Eastern Japan in terms of passenger throughput. It is also served by many regional commuter lines of Japan Railways, as well as the Tokyo Metro network. less..
Shinjuku Station is a major railway station in Shinjuku and Shibuya wards in Tokyo, Japan. Serving as the main connecting hub for rail traffic between Tokyo's special wards and Western Tokyo on inter-city rail, commuter rail, and subway lines, the station was used by an average of 3.64 million more.. people per day in 2007, making it, by far, the world's busiest transport hub. The station itself has 36 platforms, including an underground arcade, above ground arcade and numerous hallways. There are well over 200 exits. Another 17 platforms can be accessed through hallways to 5 directly connected stations without surfacing outside. less..
Kamakura Station is a railway station on the Yokosuka Line in Kamakura, Kanagawa, Japan, operated by East Japan Railway Company. Tsurugaoka Hachimangū is the most important Shinto shrine in the city of Kamakura, Kanagawa Prefecture, Japan. 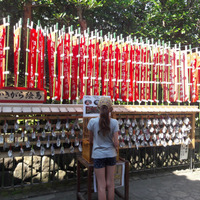 The shrine is at the geographical and cultural center of the city of Kamakura, which has largely grown around it and its 1.8 km approach. It is the venue of many of its most important more.. festivals, and hosts two museums. Tsurugaoka Hachimangū was for most of its history not only a Hachiman shrine, but also a Tendai Buddhist temple, a fact which explains its general layout, typical of Japanese Buddhist architecture. At the left of its great stone stairway stood a 1000-year-old ginkgo tree, which was uprooted by a storm in the early hours of March 10, 2010. 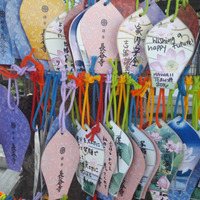 The shrine is an Important Cultural Property. less..
Kōtoku-in is a Buddhist temple of the Jōdo-shū sect in the city of Kamakura in Kanagawa Prefecture, Japan. The temple is renowned for its "Great Buddha", a monumental outdoor bronze statue of Amida Buddha which is one of the most famous icons of Japan. Hase-dera is the main temple of the Buzan sect of Shingon Buddhism. The temple is located in Sakurai, Nara Prefecture, Japan. The Main Hall is a National Treasure of Japan. Yuigahama is a beach near Kamakura, a city in Kanagawa Prefecture, Japan. The relation between the beach and its neighboring areas is complex. Although Yuigahama is legally the entire 3.2 km beach that goes from Inamuragasaki, which separates it from Shichirigahama, to Zaimokuza's Iijima cape, which more.. separates it from Kotsubo and the Miura Peninsula, the name is customarily used to indicate the portion west of the Namerigawa river, while the eastern half is called Zaimokuza Beach. This is the reason why, although the beach gives its name to only the west part of the beachside community, traces of the name Yuigahama can be found also in Zaimokuza. The center of Yuigahama came legally into being between 1964 and 1965 and was named after the beach. Today's Yuigahama was until then divided between Zaimokuza, Ōmachi, and Hase. There are different theories about the origin of the name. According to one it derives from an earlier one, Yuigo. According to another it derives from the presence of a cooperative. The name Yui itself has been written in various ways, among them 由井 and 湯井. less..
Odawara is a city in Kanagawa Prefecture, Japan. As of February 2015, the city had an estimated population of 194,672, and a population density of 1,710 persons per km2. The total area is 113.79 km2. Gōra Station is a terminal railway station on the Hakone Tozan Line as well as the Hakone Tozan Cable Car, and is located in Hakone, Kanagawa, Japan. It is 15.0 km from the Hakone Tozan Line's southern terminus at Odawara Station. At an altitude of 533 metres, it is the highest railway station in more.. Kanagawa Prefecture. less..
Lake Ashi, also referred to as Hakone Lake or Ashinoko Lake, is a scenic lake in the Hakone area of Kanagawa Prefecture in Honshū, Japan. It is a crater lake that lies along the southwest wall of the caldera of Mount Hakone, a complex volcano that last erupted in 1170 CE at Owakudani. The lake is more.. known for its views of Mt. 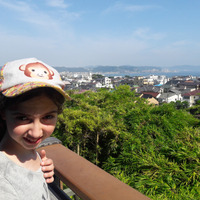 Fuji, its numerous hot springs, historical sites, and ryokan. The lake is located on the Tokaido road, the main link between Kyoto and Tokyo. A number of pleasure boats and ferries traverse the lake, providing scenic views for tourists and passengers. Several of the boats are inspired by the design of sailing warships. Most visitors to Lake Ashi stay in one of the hotels or ryokan located in the area to visit some of the local attractions. There is also a campsite at the north end of the lake. Hakone Shrine is a shrine that has been visited by shogun, samurai, and many travelers over the centuries. 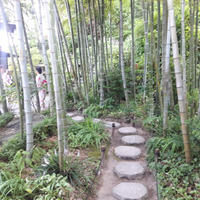 Large sections of the Old Tokaido road are preserved here. Onshi Park was the summer retreat for the imperial family that is now a public park. Taking the aerial tram Hakone Ropeway to The Great Boiling Valley. From Togendai on Lake Ashi, the Hakone Ropeway aerial tram connects to Sounzan, the upper terminus of the Hakone Tozan Cable Car funicular railway. This in turn connects to the Hakone Tozan Line mountain railway for the descent to Odawara and a connection to Tokyo by the Tōkaidō Shinkansen. The name means "lake of reeds" in Japanese: 芦is "reed", and 湖is "lake". The abundance of nature makes it popular with hikers. There are many trails with different levels of challenge. less..
Hakone Open-Air Museum is Japan's first open-air museum, opened in 1969 in Hakone in Ashigarashimo District, Kanagawa Prefecture, Japan. It has collections of artworks made by Picasso, Henry Moore, Taro Okamoto, Yasuo Mizui, Churyo Sato, and many others, featuring over a thousand sculptures and more.. works of art. The museum is affiliated with the Fujisankei Communications Group media conglomerate. The sculptural works in Hakone Open-Air Museum has about 120 on permanent display across the huge sculpture park. less..